- Our Ability - President and CEO dedicated to the video production of stories about People with Disabilities. We produce video for web and television. - Our Ability provides Human Resource consulting for companies and individuals looking for an inclusive workforce. We provide workshops, keynotes and seminars on disability and diversity. - John Robinson is the subject of "Get Off Your Knees: The John Robinson Story" a public television documentary seen around the United States and other countries. Autobiography of the same title published by Syracuse University Press in 2009. - Advocate for People with Disabilities with Disability Education Forum of New York (DEFNY.org) - 501(c)c 3 to educate people about People with Disabilities. - Available for speaking engagements - "Turning Obstacles into Opportunities!" and "What is Normal? "- Sales training and motivation, from Australia to Fort Bragg to White House. - Named to Syracuse University Alumni Board 2011. - Honored with Excelsior College President's Award for Advocacy in 2010. "John is a great human being. He is as caring and warm as he is courageous and persistent. 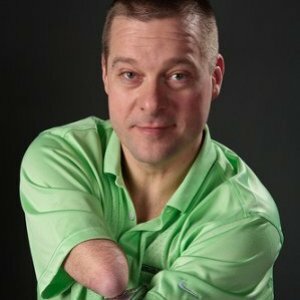 A strong motivator, John has but one goal in sharing his life story as a congenital amputee – to dispense hope and inspiration to those who can use it most." Although these stories is illustrated through experiences around being a person with a disability, it is a story of ability, acceptance and success. These are the new normal existence. So what is normal?